Totally excited to head over to the market this morning for some fresh produce and baked goods. 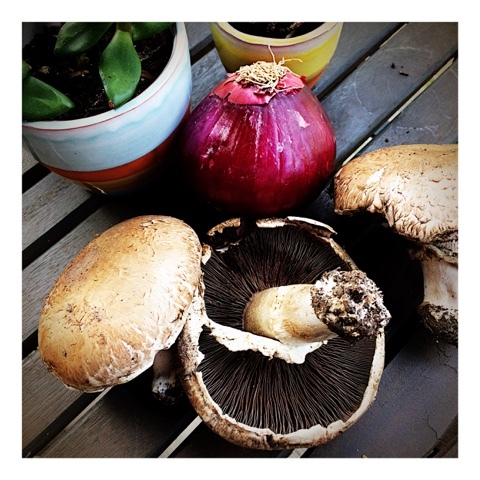 Hoping to find some awesome meaty portobellos for the post today! When possible, buying local and fresh, is the way to go…even for college students! Why? Local reduces transport costs and carbon footprints. Local supports farmers in your area. Local simply tastes better! As of late, my son, has become even more conscious of how our eating affects the environment--not going completely vegetarian, but certainly more conscious in his food choices--girlfriends have a way of suddenly changing your worldview, right? 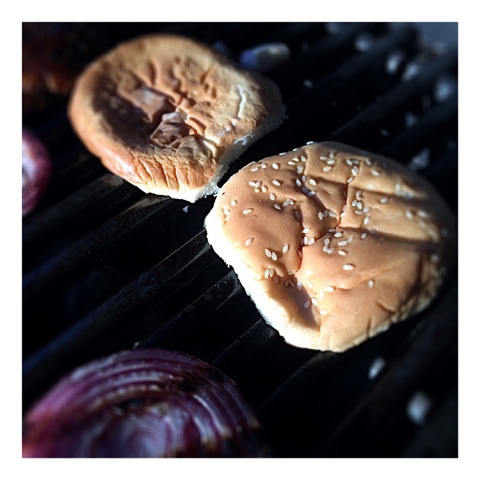 He has always loved to eat (hence this blog that provides him with all the recipes we make at home); and, interestingly, Jon has always loved foods that most kids cringe (and twist their face into ungodly shapes to) when mentioned. 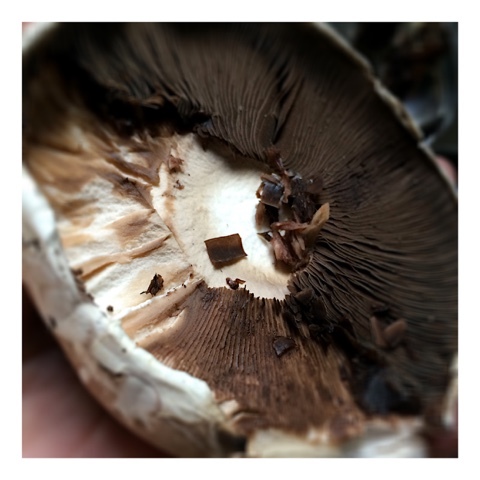 One of Jon's first requests when I started the blog was 'How Do I Make Those Mushrooms' instructions and recipe! Eat them plain, put them on burgers, add them to pasta! 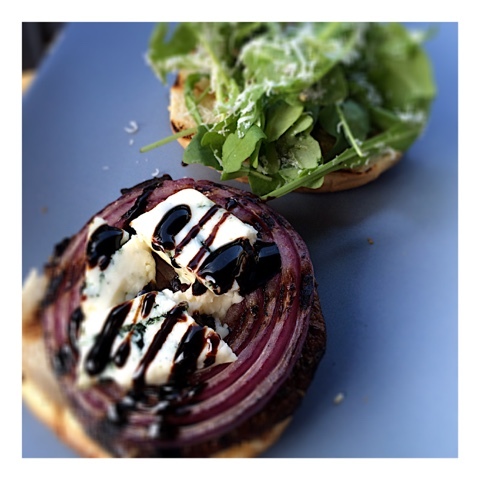 But, Jon also discovered the giant portobello grilled to perfection, drizzled with balsamic and topped off with feta or goat cheese! 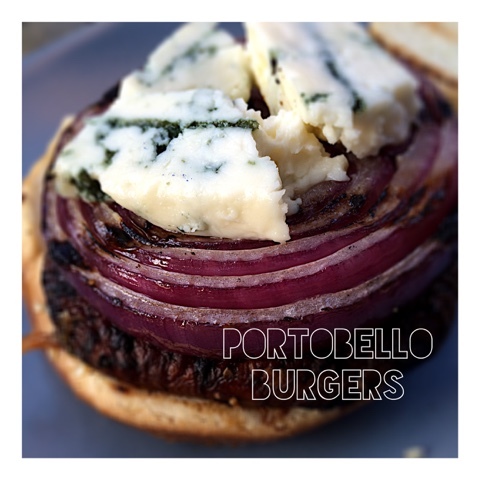 In light of Jon's mindful eating, I am posting this awesome, and simple version of a meatless portobello burger, topped with grilled red onions and Boursin (or Blue) cheese, and sandwiched between a toasted, buttery bun with arugula! 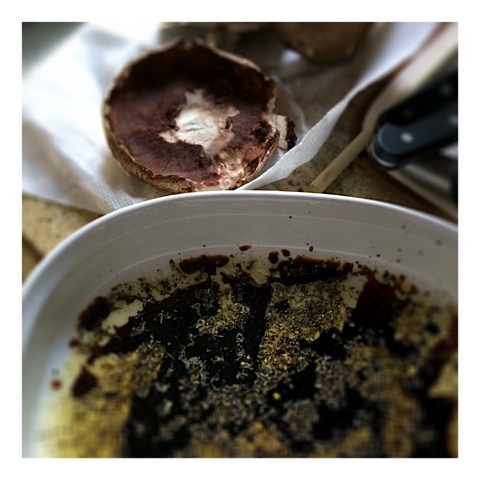 And yes…to all you doubters…this is one of Jon's favorite things to eat: mushrooms. 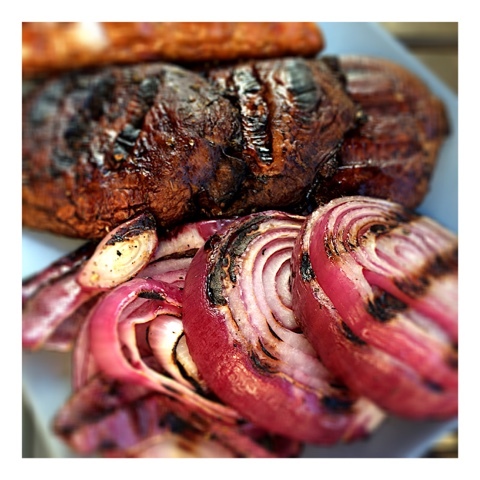 And yes…he is a college student who asked for this recipe! 2. De-stem and de-gill the mushrooms. Remove all dirt with damp paper towel. 3. 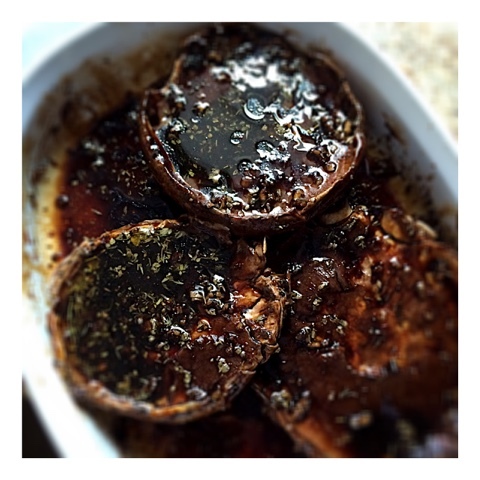 Combine the marinade ingredients into a shallow dish or pyrex baking dish. 4. 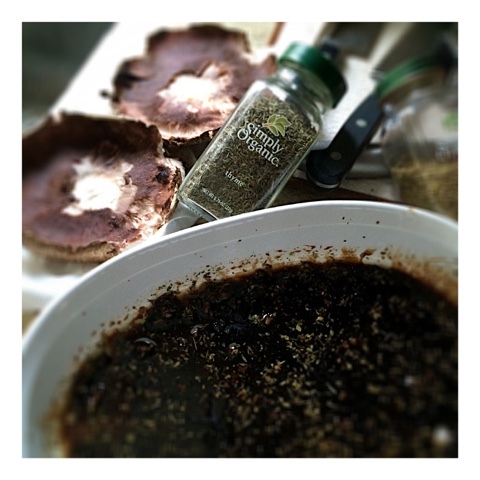 Add your mushrooms and slather in marinade all around x 20-30 minutes or longer. 5. 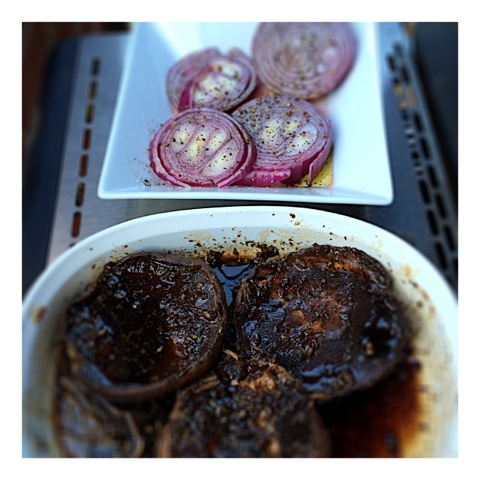 Marinate the red onion slices with olive oil, red wine vinegar (or lemon), salt & pepper. 6. 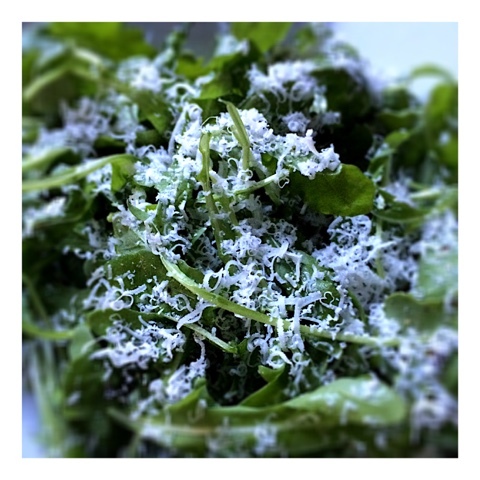 Toss your arugula with olive oil, lemon, and parmesan. 7. 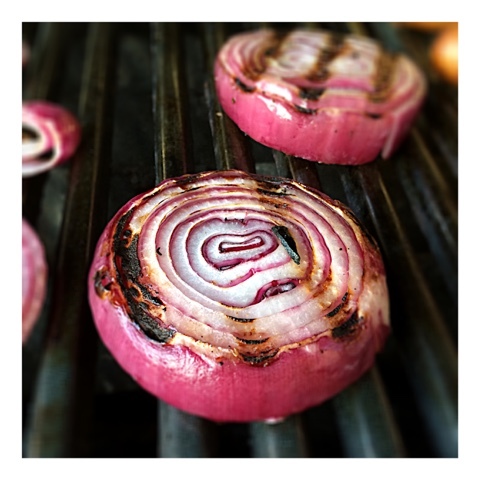 Fire up the grill, or heat your grill pan, on MED-HIGH. 8. 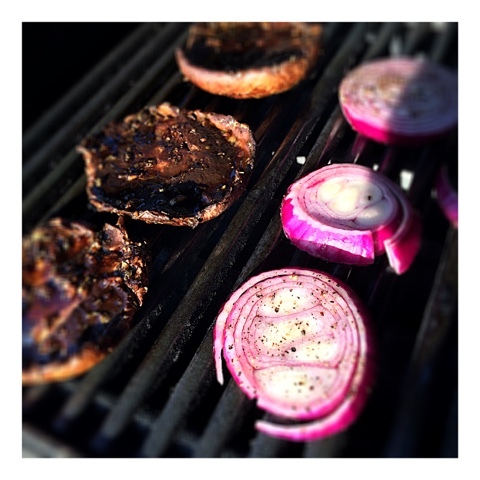 Sear mushrooms and onion slices 3-4 minutes per side untouched. 9. 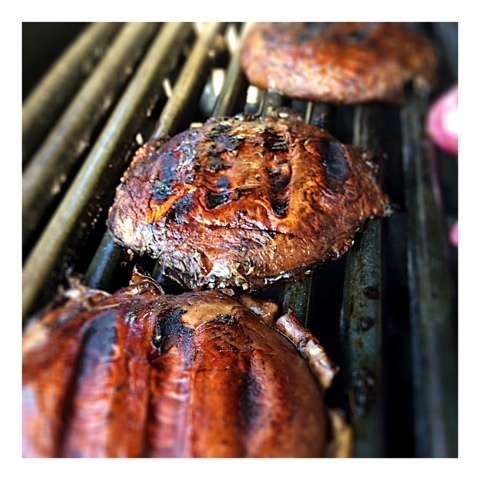 Flip the mushrooms and onion slices over for another 3 minutes. 10. Toast your buns and build this sucker high!!! The Boursin, or Bleu Cheese, will soften and melt when everything comes together!